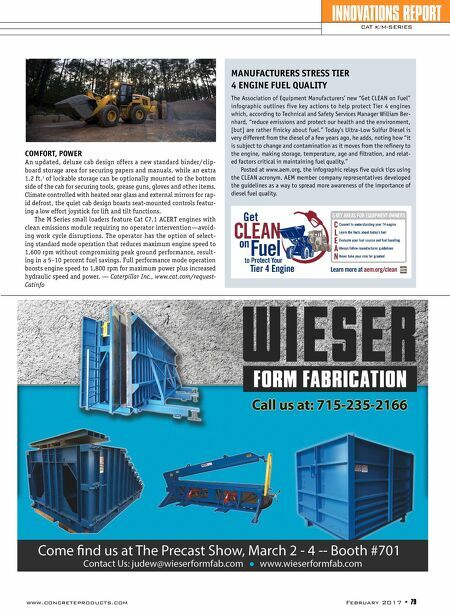 78 • February 2017 www.concreteproducts.com Engineering enhancements to the EPA Tier 4 Final Caterpillar M Series Small Wheel Load- ers—926M, 930M and 938M models—plus K Series 924K, 930K and 938K models span standard and optional features that boost productivity, improve operating ease, and increase uptime reliability. A new secondary display module option for all models improves operator interface and navigation, and affords a host of payload man- agement and service options. The new touch- screen display features a QWERTY keyboard, making it easier for the owner/operator to navigate through the menu and input text like coded start operator or application profiles, plus service-mode and preventative maintenance alerts. The display is configured to reduce the amount of time for information entry and elim- inates the arrow keys required by previous ver- sions for navigation and data inputting. Addition of the touchscreen display and Product Link Elite enables Cat to extend its INNOVATIONS REPORT WHEEL LOADERS Payload management, display module lead Cat smaller loader series upgrades Payload Management technology to the small loader series. 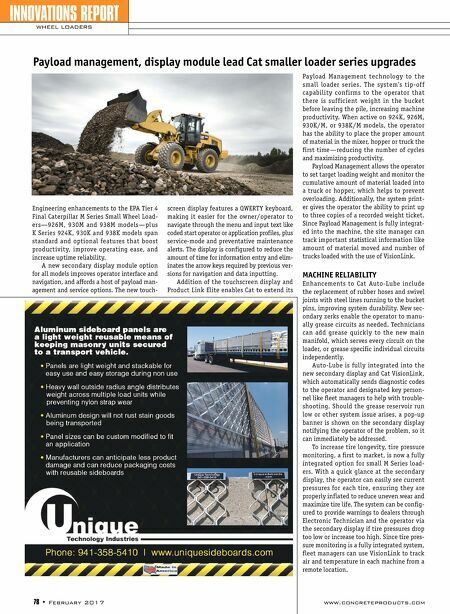 The system's tip-off capability confirms to the operator that there is sufficient weight in the bucket before leaving the pile, increasing machine productivity. When active on 924K, 926M, 930K/M, or 938K/M models, the operator has the ability to place the proper amount of material in the mixer, hopper or truck the first time—reducing the number of cycles and maximizing productivity. Payload Management allows the operator to set target loading weight and monitor the cumulative amount of material loaded into a truck or hopper, which helps to prevent overloading. Additionally, the system print- er gives the operator the ability to print up to three copies of a recorded weight ticket. Since Payload Management is fully integrat- ed into the machine, the site manager can track important statistical information like amount of material moved and number of trucks loaded with the use of VisionLink. MACHINE RELIABILITY Enhancements to Cat Auto-Lube include the replacement of rubber hoses and swivel joints with steel lines running to the bucket pins, improving system durability. New sec- ondary zerks enable the operator to manu- ally grease circuits as needed. Technicians can add grease quickly to the new main manifold, which serves every circuit on the loader, or grease specific individual circuits independently. Auto-Lube is fully integrated into the new secondary display and Cat VisionLink, which automatically sends diagnostic codes to the operator and designated key person- nel like fleet managers to help with trouble- shooting. Should the grease reservoir run low or other system issue arises, a pop-up banner is shown on the secondary display notifying the operator of the problem, so it can immediately be addressed. To increase tire longevity, tire pressure monitoring, a first to market, is now a fully integrated option for small M Series load- ers. With a quick glance at the secondary display, the operator can easily see current pressures for each tire, ensuring they are properly inflated to reduce uneven wear and maximize tire life. The system can be config- ured to provide warnings to dealers through Electronic Technician and the operator via the secondary display if tire pressures drop too low or increase too high. Since tire pres- sure monitoring is a fully integrated system, fleet managers can use VisionLink to track air and temperature in each machine from a remote location.